Solutions > Change Management > Resources > Team Charters: What are they and what’s their purpose? Team Charters: What are they and what’s their purpose? A team charter is a document that is developed in a group setting that clarifies team direction while establishing boundaries. It is developed early during the forming of the team. The charter should be developed in a group session to encourage understanding and buy-in. The team charter has two purposes. First, it serves as a source for the team members to illustrate the focus and direction of the team. Second, it educates others (for example the organizational leaders and other work groups), illustrating the direction of the team. Investing the required time to develop a charter reduces confusion about the group’s objectives. The charter also provides the information needed to reduce the risk of rework, enabling the team to get it right the first time. Team Purpose – This answers two questions: What’s the value of drawing these people together? What problem are they facing and what would be an acceptable outcome? Duration and Time Commitment – The amount of time the team will be working together needs to be documented (for example is this a six month time frame?). 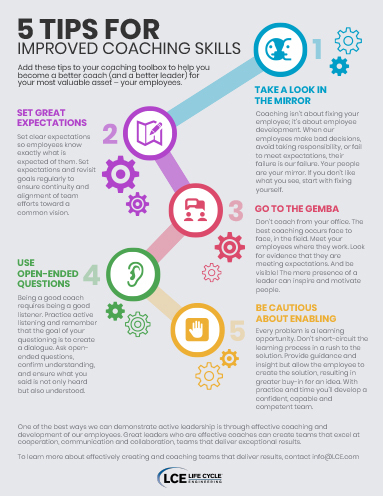 Depending on proposed solutions, the duration of implementing these recommendations may require time beyond the team’s meeting schedule. Another aspect to be considered is the estimated amount of time that will be dedicated weekly / monthly. Scope (in scope / out of scope) – Thinking though the scope helps to define the beginning and end of the spectrum. It may list departments included or excluded. The scope, while setting parameters, also helps the team leader(s) easily identify tasks that are outside of the scope, minimizing scope creep. Members – Team leader and members should be listed individually. This provides recognition and enhances commitment. Alternate members can also be listed. The team sponsor from the leadership group needs to be assigned and listed after the team members. Desired End Result – This provides an opportunity to begin with the end in mind. This is where the sponsor can establish goals for the team to achieve. The goals need to be clearly defined. By defining the desired end result, the magnitude of the change becomes evident. 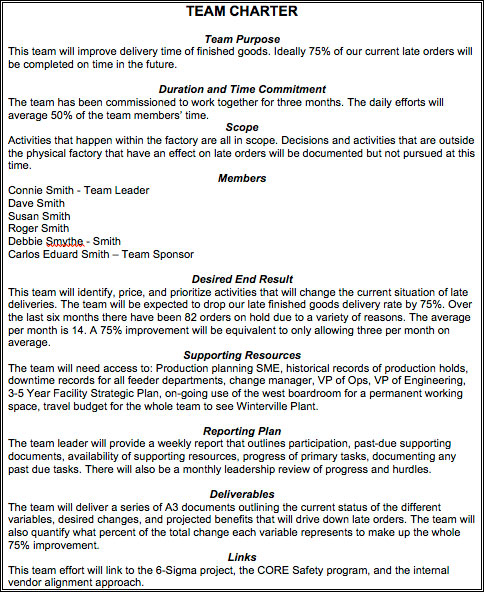 Reporting Plan – This defines how the team will communicate progress. The team usually has a higher authority that they answer to and it is important to report how the team activities are going and what hurdles the team is facing. The reporting plan should establish the frequency of reporting as well as content. Deliverables – This section defines the outputs. It should include Key Performance Indicators (KPIs) that measure the intended success. By considering the KPIs at this stage, immeasurable deliverables are eliminated early. The deliverables should include the documents, the desired behaviors, and a long-term auditing process that verifies the deliverables are in place. Links – This section considers other departments or organizational initiatives that may have overlap with the group’s purpose. It could also include key resources that are known Subject Matter Experts (SMEs) in specific fields. The hypothetical example below shows all the elements can come together to create a highly useful document that boost the team’s success.